Dynamic graffiti artist Mear One transcribes the indescribable like none other. His engaging imagery conveys the complexities of the human spirit with stunning sincerity. As he continues to evolve as an artist, Mear One draws from new and fascinating sources to construct his multifaceted moving paintings. Mear Oneâ€™s surrealistic compositions are filled with contrasting intricacies. On one hand, theyâ€™re raw and reactionary, on the other, they possess a deeply reflective and spiritual quality. The internationally acclaimed artist uses the exploration of himself, as well as the world around him, to fuel his powerful and symbolic visual messages. Format: Do you see your paintings as a tool for communication? If so, what is that you hope to communicate through your work? Mear One: Art is my favorite way to communicate ideas because it goes deeper and itâ€™s beyond one word. It opens up an area for people to interpret and receive whatever the artistsâ€™ ideas are. Format: What are some of the main themes you try to convey through your work? 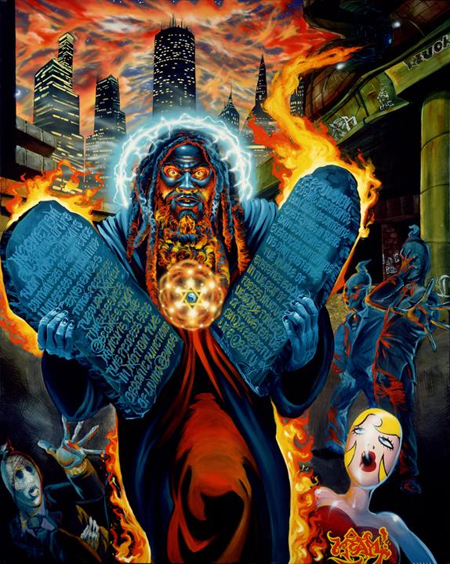 Mear One: I try to make these homageâ€™s or pathways to a higher knowledge. Some of my paintings express dissatisfaction with reality while interacting with it in new ways. I aim to express the thoughts that arenâ€™t necessarily popular or normally spoken of and hopefully promote a different way of thinking about or addressing a subject. Format: Youâ€™ve created such vivid visual stories. How do you develop your complex surrealistic compositions? Mear One: I like to challenge myself with composition where I just donâ€™t have one perspective. The picture wonâ€™t be straight on, I like to add warping to express hidden areas, and underground imagery so that it translucently comes through layers. Itâ€™s not just one vision taking place; Iâ€™d like to animate it, but itâ€™s just a painting. I try to bring through some levels of movement. Format: Your work examines certain facets of society that many people are uncomfortable or unable/unwilling to acknowledge. Can you describe your view of current worldwide dilemmas and what you think should be done to solve them? That needs to change, but itâ€™s hard to do that because we donâ€™t have an educational system that understands what Iâ€™m even talking about. I think thereâ€™s one major thing that all of us artists seem to express and that is this need to be different and go out on a limb to challenge ourselves, and others, to think in new and radical ways. When I say artists I mean everyone from an atomic physicist to a singer/songwriter. Format: Do you have any upcoming events or exhibitions? Mear One: Iâ€™m a part of a group show at the 1988 Gallery in January â€˜09, which is an homage to the Beastie Boys. Iâ€™ll also be in a number of other group shows in the first half of the new year. Towards the end of the year I should be completing several bodies of work that Iâ€™ve been spending a lot of time on. Format: Are you currently working on a project that reflects pressing current events? 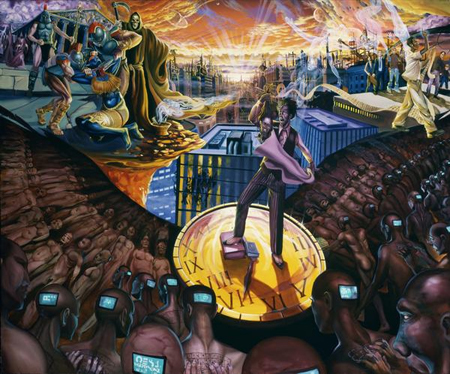 Mear One: All my work reflects current themes of the world. Iâ€™m doing a little series on money [featuring] victorious battle scenes with people tearing apart the dollar bill pyramids. My work engages me and commands me to engage the world and speak truth with my art. Iâ€™m doing a lot of abstract work that examines the human struggle. Iâ€™m also working on a series that deals with my dreams, which are related to the struggles that I face as an artist in LA. All of the bodies of work inter-relate to the now but I also try to create them so they are timeless, so 20 years down the line, thereâ€™s still something nourishing about them. Format: Who are your favorite artists/designers? Mear One: Iâ€™d say my biggest influences are MC Asher, Alphonse Mocha, Maxfield Parrish, Frank Frazzeta, Roger Dean, Salvador Dali, Robert Williams, Alex Grey, Diego Rivera. Format: Discuss your views on the current L.A. graffiti art scene. Mear One: There are moments where you are your scene and then there are moments where you realize that your scene has changed. I didnâ€™t always see myself as one, but I now consider myself an old-school graffiti artist. When I think of graffiti art, I think of a certain time period when things were a certain way. Today, with the street and security cameras everywhere, and just the way things are in general, graffiti is such different thing. Format: Youâ€™ve had an inspiring career to date. Tell us about your journey towards where you find yourself presently. 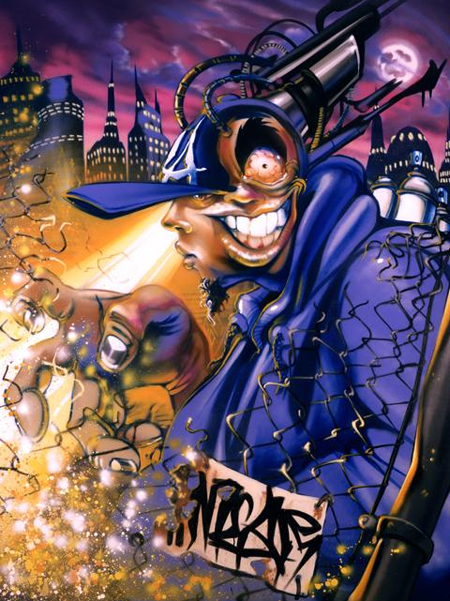 Mear One: LA graffiti artists have a connection to the gang scene via family or friends so thereâ€™s a big influence of that kind of behavior in the scene. Whether you want it or not, you have to put on a hard shell to live this city. I still feel like I kid thatâ€™s still growing into my skin. I was a really out of control when I was younger, but Iâ€™m letting go of all the anger and frustration that my teenage life really came into contact with. A lot of my fuel was anger so as I let go of anger, I have to find other interesting things to fall in love with and to fuel my passions. Anger causes way too much conflict. I no longer do my work with vengeance and aggression. Now I function with a communicative energy. Format: Whatâ€™s your advice to young artists, graffiti and otherwise, who are experiencing some of the angst youâ€™ve endured? 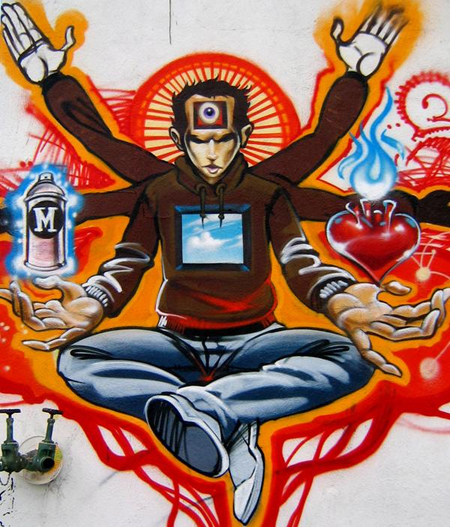 Mear One: Itâ€™s hard to tell a young person the wisdom that experience brings and expect them to relate to it. Itâ€™s kind of a shortcoming for adults to expect young people to jump on board with us and â€˜get itâ€™ just because we became wise enough to do so. Aggression is a very important tool and a lot of us need to experience it to learn how to let it go later in life. Some people come into their aggression in their 30â€™s and 40â€™s. Thatâ€™s when you get some lunatic in a post office with a machine gun. In the end, the only thing that I can say is that we all have a dream of where we want to go and what we want to do, so itâ€™s important that we work to realize our that and communicate with ourselves on a deeper level as artists. The first artist I understand (to a degree). I would do anything to get one of his paintings. Mear’s amazing. His philosophic structure has “savior” qualities for all of LA. Its not just about great art and story-telling, but conscience and awareness. I’m mesmerized with each piece.